Rosemary Kennedy, younger sister of President John F. Kennedy, was lobotomized in 1941 at age 23. In 1959, she was put out of public view at a remote facility in rural Wisconsin, where, for more than twenty years, she remained unvisited by family and non-family alike, until 1962. Elizabeth Koehler-Pentacoff (Liz) and her parents were likely the first non-Kennedy family members to visit Rosemary following her lobotomy. Liz was niece to Rosemary's caretaker, Sister Paulus, a Catholic nun at St. Colleta, and she visited Rosemary on a regular basis for the next thirty-four years. Through their friendship, Liz discovered the person many had forgotten or never known. In 2015, ten years after Rosemary's death, Liz came forward with a fascinating book about the hidden daughter of America's royal Kennedy family. 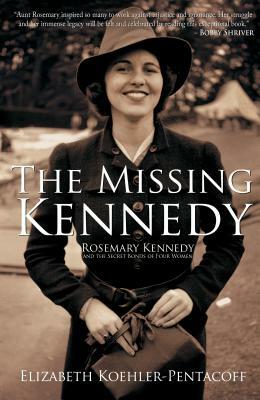 "The Missing Kennedy: Rosemary Kennedy and the Secret Bonds of Four Women" is truly unique. It is an eyewitness account of Rosemary's post-lobotomy years, the first published by a non-family member, and it's augmented by nearly 100 never-before-seen pictures of Rosemary after she was lobotomized. Why did no one visit Rosemary for more than two decades? What quality of life did Rosemary lead after her lobotomy? What should have been the correct diagnosis of Rosemary's pre-lobotomy condition? And in what ways did immense good come from Rosemary's tragic life? This touching story of the intersection of two families will leave you with a unique portrait of the missing, but not forgotten, Kennedy. The author of nine books, including a Writer's Digest Selection for The ABCs of Writing for Children, Liz has now written an adult memoir, The Missing Kennedy (Bancroft Press), which will be out in 2015. A former Byline Magazine "Writing for Children" columnist, Liz wrote frequent humor pieces for the San Francisco Examiner as well as hundreds of articles and essays in newspapers and magazines such as Parents Magazine, Writer's Digest, and Parenting. With degrees in Liberal Studies and Theater Arts/Children's Theater and two teaching credentials, she's directed plays and taught elementary, middle school students, and teachers. A speaker for international and state conferences, she presents assemblies and workshops for schools and libraries. Born in rural Wisconsin, Liz moved to California for all her college and post-graduate education, and has lived most of her adult life in the San Francisco area. She's married, and has one grown child.Visit her blog for writing advice, ideas, and anecdotes http: //lizbooks.com/blog/, contact her at lizbooks@aol.com, or visit her at her website, www.lizbooks.com.